After work and some errands I went by the Studio for some more work on the tower print. I continued work on the hardware store. Took longer than I expected- cutting out all those little tools was a lot of work. But I just kept working at it, and 2 hours later I was done. For the moment I left the area under the trap door as black. I'm not sure if I want that to remain a dark mysterious space (as well as adding a nice hunk of black in the middle of the composition), or be lighter to imply a passage from the mall escalator, which seems to be leading right to it. I can decide that later. While all this was going on, Molly was around, as well as one of her current students, experimenting with some silkscreen. We discussed a few things, including some upcoming happenings in the room- the next open critique session on November 7, some high school students the week after that, and a new use for the space under her press. The big event of the season is back. 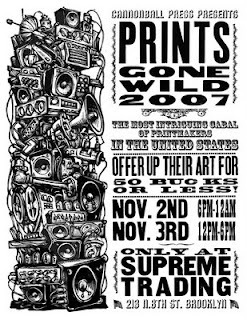 Prints Gone Wild 2 is coming back to Brooklyn next weekend, at the Supreme Trading Gallery, 213 N 8th Street in Williamsburg. Really easy to get to- just a couple of blocks from the Bedford Ave stop on the L train. 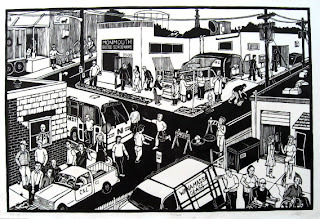 The 2 day event features a number of the Outlaw Printmakers and other like-minded print artists. Check out the details on the official poster above, courtesy of Brooklyn's own Cannonball Press. For a preview of what to expect, check out these photos from the Outlaw blog of last year's edition. Looking around the gallery is free, and everything can be taken home for $50 or less. And speaking of the Outlaws, I got a rare e-mail and phone message from Mr. Huck at Evil Prints today. He'll be in town that weekend, which coincides with the big Print Fair in Manhattan. He mentions something about some upcoming activities that will involve me in St Louis. I'll post more when I actually know something, but it sounds good. Put in an early shift today at the Studio. As planned, I continued work where I left off yesterday- the outdoor camping/whittling scene. This included the scene with figure, stump, and tent, a little work on the branches extending from the tower into the sky, and the vertical image of my carved wooden arrow. I had a little time to spare, so I started working into the next part, the family hardware store. I just did the two barrels and the wood floor. I expect to be back in there for a few hours tomorrow after work, and try to finish the rest of the store. Got up to the Studio in the afternoon and started cutting the mall section. Nothing particularly difficult, but a lot of detail, so it was a few hours steady work. The giant light fixture (with all the globes) at the far left is based on one that existed at Willowbrook, my mall growing up. The rest I pretty much invented, meant to evoke the architecture and decoration of that mall circa 1974. The eventual color choices (lots of browns and warm 70's colors) will reinforce this. One of the indoor trees in this section grows upward and becomes part of the scene above (woods/camping/whittling), so not only did this finish the 3rd level today, I have also begun the 4th level. Next time I'll finish that outdoor scene. I continued on the tower today, finishing the supermarket part of the section on the far right. There wasn't that much to cut, but it took a while because it turned out there was a lot of decisions I had to make as to which shapes would be black or white. 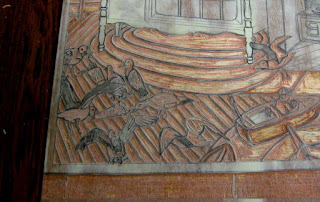 Then I moved on to the bowling section above and to the left of the church scene. A whole bowling lane would have been nice, but I settled for some alley balls in racks, and one bowling pin. All together it took about an hour. I'll save the last piece of the 3rd level (the mall, circa 1974) for my next visit, maybe on the weekend. Today when I arrived at the Studio, I found an large envelope that had been shoved under the door. It was from our landlord, a copy of a promotional/advertising booklet produced for the upcoming Breeder's Cup horse racing events at Monmouth Park in Oceanport. 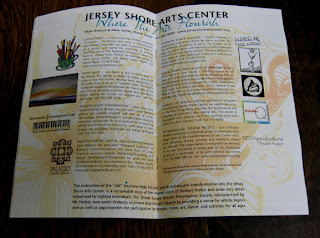 Back over the summer he had worked out a deal to get the centerfold of the booklet for a giant ad for the Jersey Shore Arts Center, and invited the various tenants to split the cost of the ad. For the relatively low price it cost, Molly and I decided it was a good idea. So we worked together on the ad copy, and provided graphic images to the person who designed it. 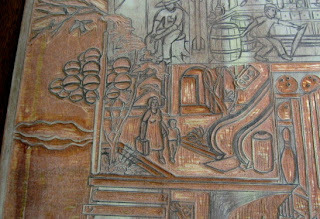 From Molly it was one of her relief prints used as a background for the whole ad (the pale orange colored fish in the top photo), and from me, my Studio Arrabbiata logo. The logo can be seen clearly next to our block of text in the bottom photo. It's my understanding that this booklet will be included in the newspaper this weekend, as well as stacks left at hotels, restaurants, and any other place that tourists might gather. I had been told anywhere from 75,000 to 90,000 copies will be distributed. It will be interesting to see if anything comes our way because of it. Dropped by the Studio after work today. I had to pick up some things I need for tomorrow's classes, but it was also an opportunity to further my progress on the tower block. Today it was the section that combines a barber shop and a supermarket. I cut out the floor and walls of the whole section, and some of the general structures. After that I concentrated on the barber related section on the left half, finishing everything related to that. Most of the supermarket area remains, but that can wait until next time. Back in August I wrote about a planned four person show at the Belmar Arts Council, a prize for the four award winners from this year's juried show. We scheduled it for early November, which would seem like plenty of prep time, but it took a while just to contact the other artists, and all of us had some complications over the past several weeks. Suddenly it's only a few weeks before the show and we have not been able to prepare an announcement or press release, or discuss how we would divide the gallery, or have a plan to install, or anything. Last week I was at the Boatworks, where I saw one of the artists, who wondered if we could postpone it. That would actually work out very well for me for several reasons. I was a little surprised to find that there was plenty of time available in the gallery schedule in early 2008. Today I spoke to the other two artists, and they were both very enthusiastic about moving the show. I have to work out exact dates with the other artists and the BAC, but it looks like it will be in February 2008. More details will follow. After watching the Giants cruise to their fifth consecutive victory, I made the trip up to the Studio to get back to my tower block. 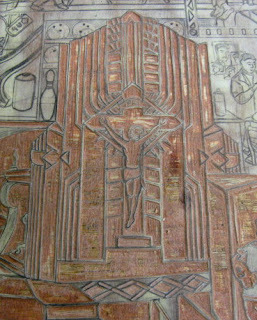 Today's focus was the Celestial Elevator (as my mother calls it), the giant marble-faced Art Deco-ish sculpture that dominates the apse of my home parish church. 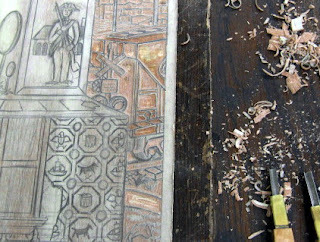 It was mostly a lot of vertical (with the grain) shapes, so a relatively easy cut. My goal was to finish it in about 2 hours, and I came within 5 minutes of that. This finishes the cutting of the 2nd level of the tower, and this large fragment extends into the 3rd. I'm expecting to get back to the Studio for a while after work tomorrow, probably get started on the section to the right of the crucifix, the combination barbershop/supermarket. 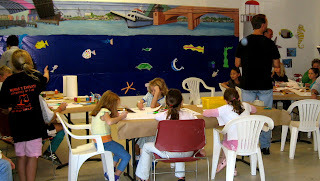 Today was Community Mural Day at the Belmar Arts Council. 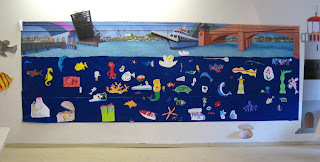 The BAC had used our large format printer to reproduce the top part of the mural as an 18' strip, and attached some blue paper along the bottom to represent the underwater portion. It was all set for our guest artists. It just so happened that today was also drop off day for an upcoming kids art show, and many of these children hung around to make some art. A few of the parents joined in, as well as a few BAC members. 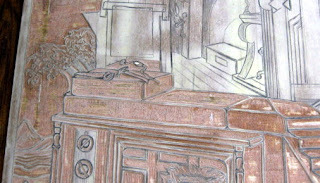 Maybe 30 or so people contributed pieces to the indoor mural. My contribution was a sunken boat. The idea came about when I mentioned the mural in one of my classes and a student suggested a sunken ship. Sure, why not? But as the idea settled in I had a more specific thought- my father's boating experiences. He grew up just blocks from Shark River in a typical extended household of the era that included his Sicilian-born grandparents. His grandfather had been a fisherman back in Palermo and taught him everything about fishing. Before long my father had his own rowboat and a small motor to go with it. (he'd move it down to the river each day in his little red wagon) The problem was hurricanes and nor'easters and the effect they have on boats. One of his boats was thrown up and impaled on a post. Another was smashed on rocks. A couple were sunk when storm surges rose higher than the length of his mooring lines, pulling the boats beneath the water. His last boat of his youth was an AMF Runabout motorboat, white hull, red deck, outboard motor. When that one ended up on the bottom of the river, he decided that, with plans to go off to college soon, maybe he should stop buying boats and instead buy a car. I thought that it would be appropriate to put one of his boats down there, and the motorboat seemed ideal. 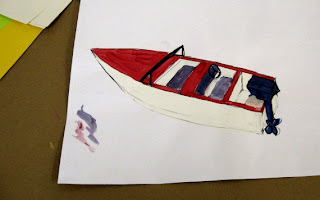 He couldn't dig up a photo on short notice, but he's got great memory for boat details and did some sketches, which I adapted as a drawing, then painted with poster paints. I cut it out, sprayed adhesive on the back, and added it to the mural. 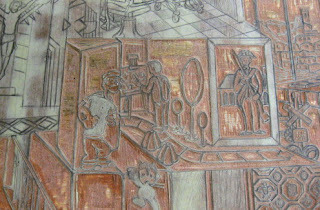 When it was all done, the mural was quite full of a wide variety of sea life. Next up is putting in some sea floor (sand, coral, plants, starfish, shellfish) on the outdoor mural, and deciding where to put the larger items. Then we begin filling in with some of the ideas generated by today's event. We're hoping to have the whole thing done by the beginning of December. I didn't go into my usual Wednesday job today, but I had little rest in a very busy day. After the usual morning routine I framed a piece of art for the upcoming 33rd Annual Members Juried Show at the Printmaking Council of NJ. Luckily I had another piece of about the same dimensions in a frame, so I just had to switch out one print for the other. While my mounting tape was drying I got on the computer and wrote an artist statement to be dropped off with the artworks. Also pulled the other print out of basement storage. After my phone call with the gallery at Georgian Court, I set out on the road. A whole lot of construction going on, but otherwise it was an uneventful trip up to North Branch Station. Dropped off my stuff, checked out the current show, chatted with our director, then headed out. Grabbed some lunch on Route 22, continued to I-287 and then exited to Route 1 North. The stretch between the interstate and the Route 9 junction isn't far, but those are hard fought miles cutting through Edison. Got to my destination, the Pearl art store in Woodbridge. There were a few things I need for classes the next few weeks, and I had a gift card with some value left on it. One thing I was looking for isn't in stock (and I'm told never will be again), but I found the stuff I need in the short term. As a bonus, the frame area was stocked up more than usual, and now that I know the solo show is coming soon, I picked up some of my favorite sizes. At first I was going to head straight home, but then as I was passing through Neptune on the Parkway, I decided to divert to the Studio in Ocean Grove. Not to work, but to pick up some stuff that will be useful for tomorrow's class. From there, I went down Route 71 into Belmar. There was a movie scheduled tonight at the Boatworks. I wasn't planning to stick around for that, but the building was open, and I used the opportunity to measure the front gallery space. With the 4 person show coming up, we have to decide how to divide the space. I also spoke to some of the people there about that show, and some possible changes. From there, finally went home. Today I confirmed some of the details of my next solo show. 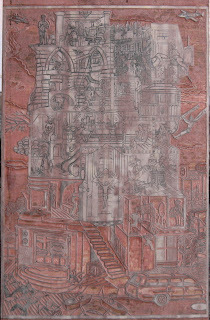 This will be at the M. Christina Geis Gallery at Georgian Court University in Lakewood, NJ. 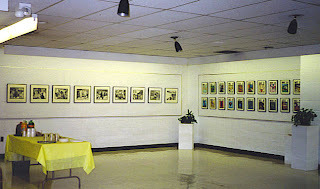 The exhibition will be on display weekdays from March 3 to March 28, 2008. There will likely be a reception during that first week in March, specific day to be named later. The above photos are from my previous exhibition there in 1999. It's a nice sized space, and I'm told that it's been refurbished- the pegboards replaced with more conventional walls and a different hanging system. Last time I had about 50 framed prints on display. My plan is to feature as much different (new) work for this show as I can, even though most of the audience from the last one is long gone. I'm always happy to have a solo show lined up- it's an extra incentive to get some new prints done. After work I made a stop at the Studio to continue working the area I had been yesterday. I finished the crude kid's club house just above/behind the hand tools. Then I moved to the section to the immediate right, the scene from Bugs Bunny. I took photos of that section as usual, and decided that this was a good point to show the progress on the whole block. Had just enough daylight left to take the block outside to shoot. (not enough light inside to shoot the long view, camera goes into flash mode, obscuring the image) I figure that I'm about a third of the way done with the cutting. In square footage it's probably closer to half, but what remains is a lot of detail. So far I like what I'm seeing. Before heading out to my sub job today, I attempted to send a bunch of images to the gallery that had been contacted last week about a possible sale. Since I had about 20 images to send, I thought I'd break it down into 3 e-mails, to keep the overall file size smaller. I wrote up the first, attached several images, sent it out. Just about to begin the second when mail arrives for me, the return of the one I had just sent, error message claiming the destination box was full. No point in sending more right then. So instead I called the gallery in the early afternoon, spoke to the other partner, the one I know best, and updated her on the situation. She gave me an alternate e-address to try, and we discussed a few more details of the plan. They will send the images to the customer, let him pick what he wants, and I'll wait until then to send something- for the buyer, and maybe a few for the gallery. When I got home in the evening I found a phone message from the other place where I may be showing. Some specific dates were suggested for the exhibition, as well as installation and take down days. Still a few details to work out, so I'll hold off on posting the specifics here until I know for sure what's going on. Late in the evening I tried the new e-mail address, sent three letters each with several attachments. Seems to have worked. After putting in my time on the mural in Belmar, I went to the Studio to continue my long term project. First I sharpened my 2.0 mm komasuki (round gouge), the tool that I do the bulk of my cutting with. The part of the block that was tough to cut yesterday was still a little rough, but the sharpening helped there, and made a big difference when I started cutting out some fine detail areas. I finished the game board related stuff, the nursery school art corner, and the adjacent colonial folk art image. 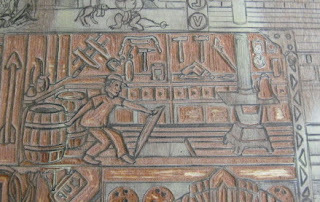 I moved on to another part of the second level, on the far left side, and took advantage of my newly sharpened gouge to cut out the tiny detail of the hand tools, as well as the wooden building blocks they're resting on. With other things to do today, I stopped there. But I expect to be by tomorrow after work to finish the club house behind the tools, and maybe the cartoon scene next to it. Phase 2 of the mural got off to a great start this morning, as several people turned up to put down the background of deep blue water. From our Siperstein's supply we started by rolling layers of Aquamarine (upper) and Blue Bayou (lower), but then went over it all with brushwork and various mixes of the two colors to give a more watery feel. The results are shown in the bottom photo. So far, so good, though most of the under water space will be covered with the collective fantasy of what lies below. Before then the unpainted strip along the base of the wall will be dealt with- sand, maybe some plant life. 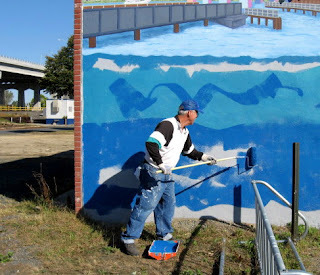 The next big event is the Community Mural Day at the BAC Boatworks, Saturday October 20, 12 to 3 pm. The public of all ages and artistic abilities is invited to come by to provide input as to how we'll complete the mural. 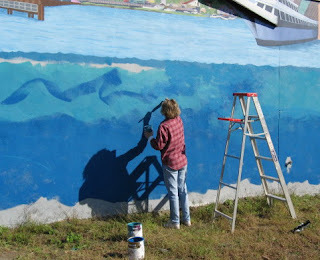 A 4' x 18' reproduction of the mural will be mounted on wall inside, and art materials provided for all interested persons to create their own ideas of what lies beneath the surface of the Shark River inlet. These will be attached to the indoor mural and laminated for future showings around town. The artists working on the outdoor mural will later choose favorites from the community suggestions to enlarge and incorporate into the full size version on the wall outside. Today I finished the last piece of the base level of the tower, a part of one of my old bedrooms- the window I would haul myself up to look out of while in my crib, and the wallpaper I tore off while in such a position. With that done I moved up to the second level, finishing the large block and my last black and white cartoon character, and started cutting out the game board and painting corner. 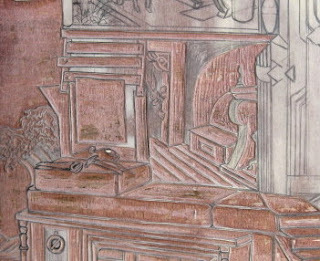 This part was cutting rough- don't know whether it was the wood or if my gouge needs sharpening. The latter is probably due in any case, but I decided to put that off until tomorrow. There was a big event in the building tonight, and I decided to get out of there before the crowds blocked my truck in. Phase 1 of the mural at the Belmar Arts Council is now complete. The last few touches were put on the big boat and Main St drawbridge, and the scaffolding is all gone, giving us the first clear view of the whole wall in months. Phase 2 begins tomorrow, weather permitting (and it looks like it will be cooperating). We will be putting in a darker blue along the remaining part of the wall, representing the area under the surface of the water. What else goes under there? Some of that is up to the people of Belmar, who will be invited to make suggestions at an upcoming event. Plus we on the mural crew have a few of our own. Updates will follow. No time to get to the Studio today, but things are still happening. This morning I got a call from a gallery with news of a possible sale. I had a show in Princeton a couple of years ago, got some nice comments, some good press, sold a print. I figured that would be the end of it. Then a year ago I get an e-mail from someone who saw that show, still remembered it a year later, and decided he wanted to buy one for himself. Found me through my website and we eventually worked out a deal. So I figured that would be the end of it. But then I get a call today from a NJ gallery that keeps some of my work in bins. 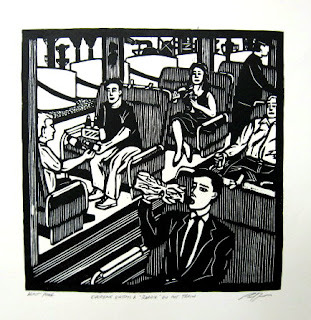 It seems that another person who saw that show in 2005 is now looking for a print, and found a link to the gallery, and has made an inquiry about acquiring one. Still a few things to work out, and I never count a sale as final until the money is in my hand, but it's a promising development. 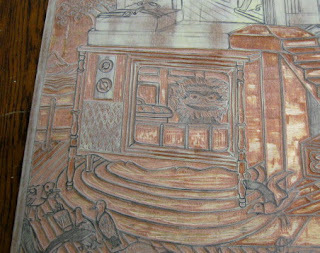 The next several hours were spent at school, including starting a woodcut project with my evening 2D class. Got home late, got on the computer, and found an e-mail with news of a possible solo show coming up in 2008. I'll post details as to where and when as soon as I get some official word. But so far, it's been a pretty good day. 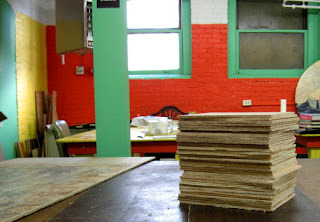 After I finished cutting up the wood for my students, I was able to turn to work of my own. I cut another piece at the base of the tower, the television. First the cabinet and hardware, then the image on the screen. Pretty much went as expected, took about an hour. Thanks to my countryman Mr. Colombo, my first Monday off from work in months. No time to rest however. I took a ride to Home Depot to pick up some wood and other small items. 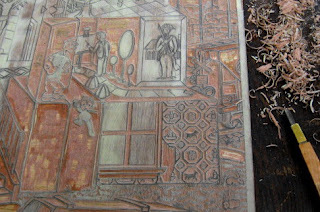 The wood was mostly for my 2D students, one class of which begins their woodcut projects this week. 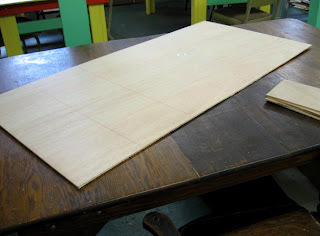 So I picked up three 24"x48" lauan panels, two for the students and one for me, for a project I hope to start later this fall. From there right to the Studio, where I marked out 8"x6" blocks (top photo), sawed them, and used some 36 grit sandpaper to remove the splintered bits along the back sides. The bottom photo shows the resulting stack. Molly arrived shortly after I did, and I asked her how things ended up with the critique group last Wednesday. Great it seems, finally breaking up around 10 pm, more than an hour after it was planned to end (and after I had left). Everyone in the group agreed that this should be an ongoing thing, so it looks like we'll all be back in November, plus maybe more artists with the publicity she has planned. A beautiful warm sunny Saturday afternoon, and I spent much of it (minus a short walk to visit a gallery in Asbury) in the Studio. Today's focus was the center of the base of the tower, the area around the stairway. I started with the bit of carpet at the base of the stairs and the hardwood floor under the stairs, then the adjacent tall wooden block that holds up part of the second level. Next was the alphabet block under the stairs. Then I cut out the negative space around the stairway handrail. After my gallery break I dealt with the stairs and landing at the top of the stairs, finished the railing, then cut the large wooden blocks too the right of the stairs. That included cutting out Felix. I decided to end it there for the day, having finished a nice sized chunk of the tower. Got a nice surprise in the mail the other day- a show announcement from my old college roommate Michael Barnes. (Okay, it was just 6 days of sharing a dorm room while doing a workshop at University of Texas- Arlington, but it's technically true.) Not just a postcard, but an 8.5" x 14" folded card with several illustrations. 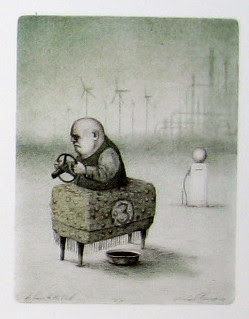 The image above is A Race to the End, one of his recent lithographs. The show is called Miscellaneous Wanderings, and collects prints and drawings from Barnes from 1992 to 2007. It opened today at the Larson Gallery at Columbia College in Columbia, Missouri, and will remain up through October 31. Reception and artist talk at 1 pm on October 29. If you can't make it to the show, you can see more of his art on his website, and keep up with his adventures on the Outlaw Printmakers blog. After my work day I went on some errands, and eventually made my way to the Studio. Today's effort was directed at the lower left corner. Finally cut out all the gulls, as well as the fries and pizza they are picking at. Since some of the birds overlap the rug that's under the television, I went ahead and cut that as well. Around then people started arriving for the open critique session that Molly organized. Some familiar faces- one of her current students and two former students, as well as 2 people who saw the listing in the Monmouth County Art Calendar. Plus Molly and me. 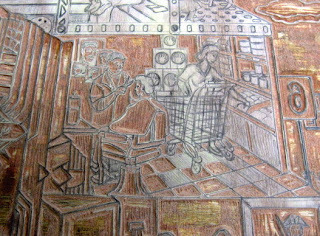 Even though all the people who came have printmaking experience, all the work brought was painting related. Between all my very long days and lack of sleep, I didn't plan to hang around long, but it was fun to get together and discuss art at a level that rarely is reached with my classes. Around 9pm I finally excused myself and headed home. I assume it went on for a while after I left. Based on how things went, I'm guessing this will become a regular thing. Got the word today that I have had two pieces accepted into the Printmaking Council of New Jersey's upcoming 33rd Annual Juried Members Exhibition. 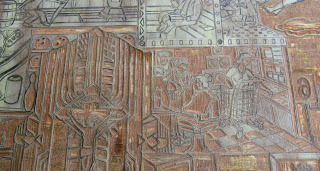 They are the pieces shown above- Employee (top) and Everyone Enjoys a Roadie on the Train (bottom). It will be the second exhibition for each of them, the former shown first at the Belmar Arts Council, the latter shown at the SGC conference this past year in Kansas City. 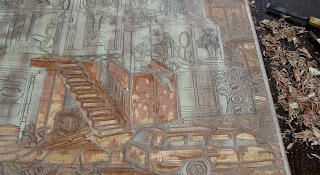 The show opens Saturday, November 10, with a reception from 1-4 pm, and remains on display through January 26, 2008. My goal today was to finish all the vehicles around the base of the tower. I started with the ADM hopper car on the right of the block. It's just a small piece of the car, so it didn't take long. More time was spent at the bottom of the block cutting the boardwalk boat ride. In each case, there were no surprises. It all took about 2 hours. Still have to deal with the gulls, then start on the tower. Maybe Wednesday. Speaking of Wednesday, my Studio partner Molly told me today that she's decided to host a free open critique night in our shared space. It will be this Wednesday, October 3rd, at 7 pm and plans are to host such an event on future first Wednesdays of each month.